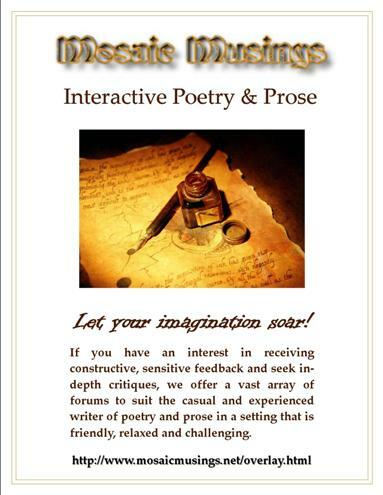 Mosaic Musings is a privately owned and operated closed writer's online community, created with the intention of providing fun, challenging and informative discussion forums. 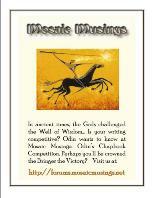 Mosaic Musings is in no way affiliated with any other sites offering similar content, unless specifically indicated. You understand and agree that the Site is provided 'as is' and that Mosaic Musings assumes no responsibility for the deletion, delivery or failure to store any user communications. You are responsible for obtaining access to the Site, and that access may involve third party fees (such as airtime charges). You are responsible for those fees, including those fees associated with the display or delivery of the Site. You are also responsible for all equipment necessary to access the Site. Membership to Mosaic Musings is free of charge. In consideration of your use of the Site, you represent that you are of legal age to form a binding contract and are not a person barred from receiving services under the laws of the United States or other applicable jurisdiction. Persons under the age of 18 are not permitted to join the Site unless the special permission is granted. 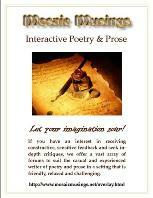 You may contact lkanter@mosaicmusings.net for further information. 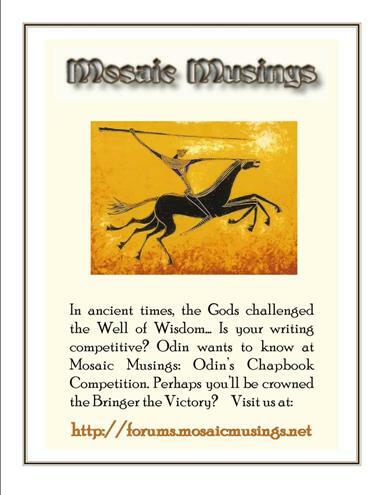 You understand and agree that membership to the Site may from time to time include communications from Mosaic Musings. Such communications include, but are not limited to, any announcements and administrative messages. Mosaic Musings reserves the right to cancel or suspend membership to any member at any time. Not withstanding any rights you may have pursuant to Forum Participation Rules, upon termination, your right to use and access the Site will immediately cease. If your application for membership is accepted, you will receive an account and a password. You are responsible for maintaining the confidentiality of the password and account, and are fully responsible for all activities that occur under your password or account. You agree to (A) immediately notify Mosaic Musings at lkanter@mosaicmusings.net of any unauthorized use of your password or account or any other breach of security, and (B) ensure that you exit from your account at the end of each session. Mosaic Musings values freedom of expression, but not at another's expense. The Site is a closed writer's community. The Site is intended to provide an educational environment, a sanctuary and a learning center for writers and unacceptable behavior will not be tolerated. Members agree to be courteous when responding on either the private Forum or by personal email to posts made in their personal threads. Support and recognition speaks volumes when reciprocal feedback is given in this educational environment. You understand that all information, data, text, messages or other input ("Content") posted on the Site, are the sole responsibility of the member from which the Content originated. This means that you, and not Mosaic Musings, are entirely responsible for all Content that you post, email, transmit, input or otherwise make available using the Site. Mosaic Musings does not control the Content posted in its Site and, therefore, does not guarantee the accuracy, integrity or condition of the Content. You understand that by using the Site, you may be exposed to offensive, indecent or objectionable Content. Under no circumstances is Mosaic Musings liable in any way for any Content, including, but not limited to, any errors or omissions in any Content, or any loss or damage of any kind incurred as a result of the use of any Content posted, emailed, transmitted, inputted or otherwise made available on the Site. (K) Reproduce, distribute, publicly display or publicly exhibit any Content provided on the Site. You agree to keep personal disputes out of the forums. If there are any questions in this regard, you agree to seek the advice of a Staff Member. If a dispute cannot be resolved amicably, you agree to be respectful to all members' feelings and seek the avoidance route. If your dispute is with a Staff Member, contact an Administrator directly. You acknowledge, consent and agree that Mosaic Musings, may access, preserve, and disclose your account information and Content if required to do so by law or in a good faith belief that such access preservation or disclosure is reasonably necessary to: (a) comply with legal process; (b) enforce the Terms of Service; Â© respond to claims that any Content violates the rights of another; or (d) protect the rights, property, or personal safety of Mosaic Musings, its members and the public. Content displayed on the Site is protected under U.S. Copyright laws and cannot be copied, altered, uploaded, transmitted, published, distributed, reproduced or sold, in whole or in part for any purpose other than for non-commercial and personal use. Further restrictions on the Content may depend on the Forum Participation Rules associated with the Forum in which the Content is posted. All works posted on the Site are submitted on a voluntary basis. This allows Mosaic Musings to display and archive such works within Site, and if applicable, allows members to comment on such works. All exclusive rights are reserved by the respective copyright owners and no redistribution including publication or reproduction in any form is permitted without express permission of the copyright owner. For more information regarding U.S. Copyright laws go to: the U.S. Copyright Office website by clicking here. Mosaic Musings, mosaicmusings.com, mosaicmusings.net, mosaicmusings.org, all hostnames therein, and any Mosaic Musings logos are trademarks of Mosaic Musings. Without Mosaic Musings permission, you cannot display or use any of Mosaic Musings' trademarks. (A) Pursuant to Title 17, United States Code, Section 512Â©(2), copyright infringement notices should be sent to Mosaic Musings' Designated Agent by facsimile 978-341-0136 or email copyright@mosaicmusings.com in accordance with the procedure outlined as 1 through 6 below. Please note that inquiries that are not relevant to copyright infringement notices will not receive a response from Mosaic Musings' Designated Agent. (6) A statement that the information in the notice is accurate, and under penalty of perjury, that Notifying Party is authorized by law to act on behalf of the copyright owner of an exclusive right that is allegedly infringed. (B) A copyright infringement notice containing the information outlined in 1 through 6 above in this section duly received by the Mosaic Musings Designated Agent will be handled accordingly by the service provider. The service provider shall take reasonable steps to notify the member who posted the allegedly infringing content on the Site, to the extent possible. The Terms of Service and relationship between you and Mosaic Musings shall be governed by the laws of the state of Massachusetts without regard to conflict of law provisions. Your use of the Site is at your own risk. Mosaic Musings makes no representations, warranties or conditions, express or implied. Mosaic Musings disclaims any and all warranties or conditions, express, statutory, and implied, including without limitation (A) warranties or conditions of merchantability, fitness for a particular purpose, workmanlike effort, accuracy, title, quiet enjoyment (B) warranties or conditions arising through course of dealing or usage of trade and Â© warranties or conditions that access to or use will be uninterrupted or error-free. Mosaic Musings is not liable for any loss or damage arising from your failure to comply with the Terms of Service. Mosaic Musings is not liable to you for any direct, indirect, incidental, special, consequently or exemplarily damages, even if Mosaic Musings has notice of such damages. Such damages include but are not limited to (A) damages to tangible or intangible property, (B) damages for loss of profits, goodwill, use, data or other intangible losses, and Â© damages resulting from statements or conduct of any members or any third party.